Warsaw School of Computer Science has been situated at its new registered office at 17 Lewartowskiego Street since October 2004. The building owned by the School is located on an area of nearly 3000 m2. The modern building has been adapted to its didactic needs and contains: 4 lecture halls - each suitable for 130 students, 10 computer laboratories, 6 practice rooms , 1 conference room, student's canteen, academic library, a gym, administration rooms and offices, the School's archives, sanitary rooms and storages. The building has been completed at the highest usage standards according to effective requirements and rules. The exploitation project of the building matches functionality and inner beauty. The available areas are used to maximum limit thanks to unconventional arrangement of halls and corridors and designing of usable rooms. The classrooms and some of the social rooms have been equipped with the modern audiovisual infrastructure (amplifiers, Wi-Fi access, audiovisual projectors, screens), and functional, ergonomic furniture. There is also a "city garden" for the students and the staff to relax. The report about the School made by the Polish State Accreditation Committee (19th-20th January 2007) states: "well-organized laboratory base. 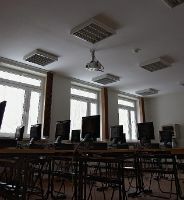 Modern computer equipment with the proper software allows for educational program implementation and satisfying students' interests". It is worth mentioning that the school cooperates with the leading IT sector companies in creating computer science infrastructure, HP and Cisco in particular. The School administrates the unified LAN network with 350 terminals (including 288 didactic terminals), and 5 modern laboratories designed for the needs of specializations held within the studies, and laboratory for the elemental technology. Moreover, there is an assembly hall equipped with special TV prepared for lectures recording, for own and contracted purposes. Thanks to the dedicated fiber link it has got its own Internet access with the capacity flow of 100 Mb/s. The integrated School's IT system is managed form Academic Centre of Didactic Research and Information Resources which is equipped with 16 servers dedicated for various system areas. The aim was to build technical infrastructure that prepares students to work on analysts' positions, designers, and programmers, and that helps in effective management and analysis, and in software designing as well. The laboratory allows for the software designing support for educational use, and for preparing students for software designing also for commercial use. The managing and programming methods have been developed in it for the use of students and cooperating companies. These are in the forms of trainings or prepared together high quality IT systems. decision support and "intelligent" knowledge bases search systems. The aim was to design technical infrastructure which helps students prepare for working in companies making or using programming operating on multimedia data (e.g. commercial films, film and audio studios). 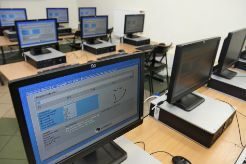 The laboratory facilitates introducing the students to computer graphics branch, introducing them to the basic concepts and algorithm of raster computer graphics, and also to the equipment, software and use of the graphics. Additionally, students have a chance to get acquainted with visual programming through the use of object-oriented language and graphics interface, the devices for speech acoustics and multimedia systems. The laboratory contains equipment and software base (3D graphics, sound software, and devices for creation of animations and films). The aim was to design technical infrastructure which helps students prepare for working on database expert positions, and to help in acquiring IT and information systems of the company, IT system projects management, information circulation, basic concepts of artificial intelligence field, and the use of expert systems in business, management and technology. The laboratory facilitates creation of software supporting business management, what allows for introducing to those devices that support managing of systems designing process in particular, their implementation and accounting of particular stages of the project. Moreover, there are devices implemented which support managing of information circulation in the company. The laboratory contains equipment and software base (ORACLE and MS SQL database systems, software supporting projects management. CASE type devices, devices for expert systems design). The aim was to design technical infrastructure which helps students gain essential practical knowledge which is demanded from the students of technical schools of higher education according to effective education requirements. The laboratory contains equipment and software base. The aim was to design technical infrastructure which helps students to gain theoretical and practical knowledge from design field, development and maintenance of computer networks, and to be prepared to get Cisco Certified Networking Associate (CCNA) certificate. The laboratory allows for solving real problems and offers the multimedia access and devices for self-studying. We opened a modern laboratory in Warsaw School of Computer Science adjusted to the needs of the blind and the short-sighted who wish to develop their knowledge. The laboratory is free of charge an available not only for our students, but also for all those interested in using our School's educational resources. Thanks to the modern equipment used in No Barrier Laboratory the blind and the short-sighted will be able to easily use computers with software for speech synthesis. Advanced technological solutions will allow for printing texts in Brail, using photocopier, speech synthesizers, enlargers, Internet, and participation in discussion forums. Our aim was to create a place, where the disabled will have the same opportunities to gain education as the others - says Mr. Andrzej Zylawski, President of Warsaw School of Computer Science. - To facilitate an access to laboratory's resources for people out of our School we are working on our own computer science module, thanks to which it will be possible to book a station by the electronic way, get the materials from the server, and participate in the discussion groups. The School's books collection includes the latest issues from computer science field, published by the IT expert publishing houses. According to our students and staff, our library quickly follows developing market of computer science new releases. The School subscribes 24 magazines. The of professional magazines are stored. It has been decided to resign from subscription of those magazines that are available via Internet. The library's collection is enriched by compact and VHS cassettes. There are not any printed catalogues any more. The books are compiled on computer by Library System. There is an access to Library's catalogue on our website. The Library administers the reading room which is equipped with the computers useful for students. At present the library's collection reaches around 13 000 volumes. The collection is divided into sections: databases, IT business, CAD, DTP, digital lifestyle, digital photography, computer graphics, artificial intelligence, games, hacking, hardware, office, computer fundamentals, programming, systems engineering, projects management, internet servers, computer networks, operating systems, web mastering, electronics and electronical technology, physics, mathematics analysis, probability, profession ethics, organization and management, human resources management, knowledge management, micro and macro economy, managers' decisions, operating research, accountancy, small business.